I have recently become obsessed with hanging woven tapestries. They have returned from the seventies with a modern look and I can't get enough of them. 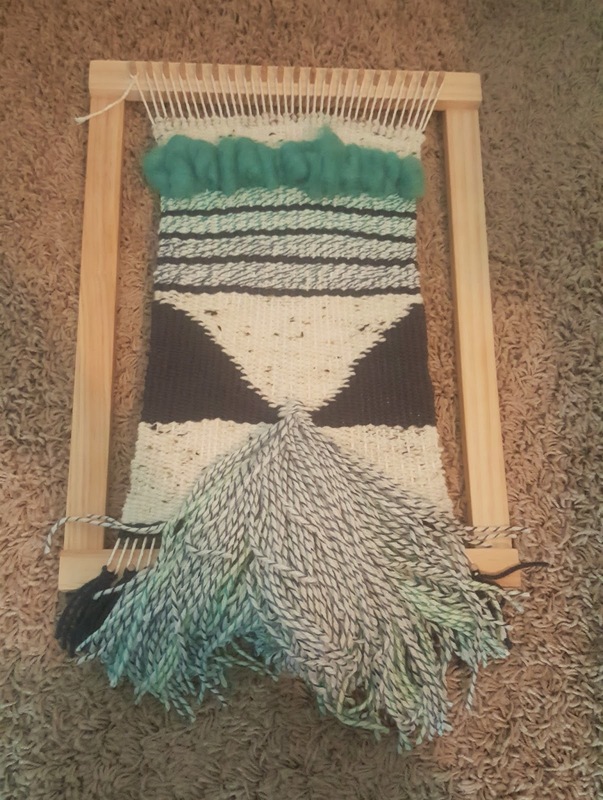 I decided to try my hand at weaving and thought I would share with you how things are going. To start, I needed weaving inspiration so I started a Pinterest Board dedicated to them. 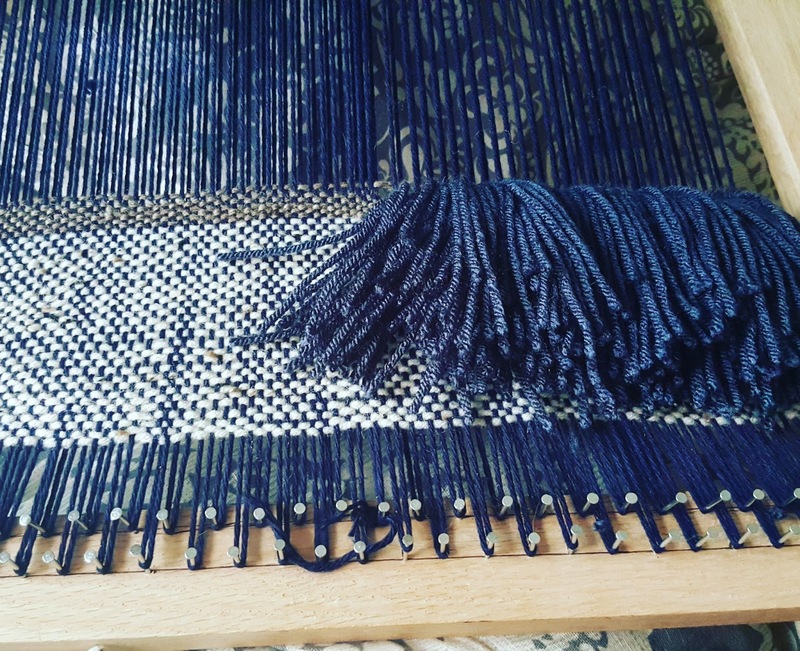 This of course inspired me to want to make all the woven tapestries which are really complex and not probably best for beginners...lesson learned. 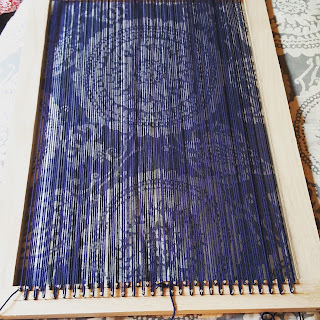 I started out on a loom that my husband made me. I was whining about wanting a large loom for a certain space in my formal living room and he offered to make me one. There are several tutorials which can be found on blogs and YouTube. We used this one. The loom itself turned out nice but might have been a bit more than I could handle to start. I then picked up some yarn for the colors I wanted in my tapestry. I headed out to my local craft store and grabbed some cotton yarn for the warp. Apparently you can use a lot of different kinds of yarn for the warp but many sites recommended cotton so that's what I went with. I also picked up acrylic yarn to work with. I like to crochet, especially amigurumi (Japanese for small knit and crochet animals and characters) and have learned that while other yarns are nicer for blankets and household items, cheap acrylic yarn works best for designing things so figured I'd go with the same concept for my tapestry. I'm not sure that I agree now after a couple of attempts. I actually think the acrylic yarn is more pliable which can cause it too stretch more than a natural yarn would. 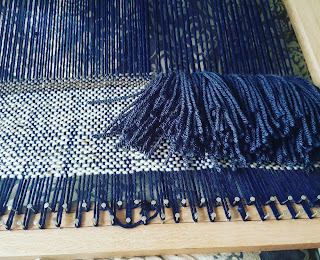 Creating the warp was pretty easy, just creating the rows with the cotton yarn in which I would weave against. 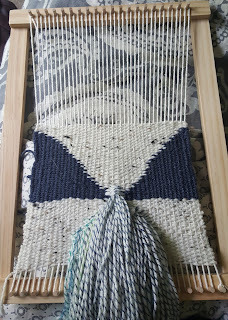 I started my large weaving and it was off to a great start. 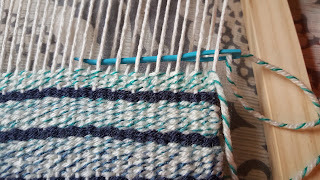 I had a shed stick (insert in the warp to open and close the warp when desired) to make the weaving process go faster. It appeared to be working and I was thinking to myself, "this is easy and awesome, I can make a ton of these!" 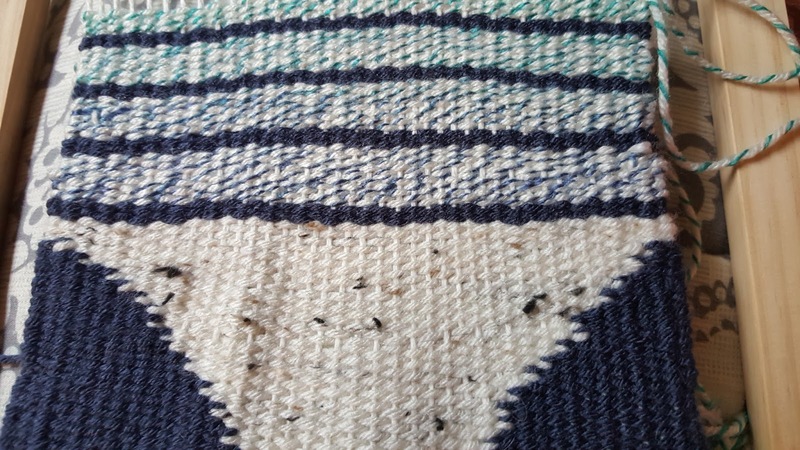 After about 30 rows, I started to notice that the sides of my weaving had started to narrow from the base. No big deal I thought, it will just be a bit smaller than I had thought. After another few rows I realized the warp had gotten really tight and it was difficult to pull the yarn through. Also, there was a ton of the warp showing through. My acrylic yarn should be the highlight, not the warp! 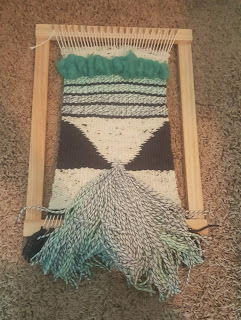 So I took to the Internet again and learned that my weaving was just too tight. I was pulling too hard putting to much pressure on the sides and the warp. This caused my sides to narrow and my warp to show through. Not good. I could have kept going, as difficult as it was, and thought about it but then decided if I was going to get it right, I needed to pull it out and start again. And maybe not on something so big. 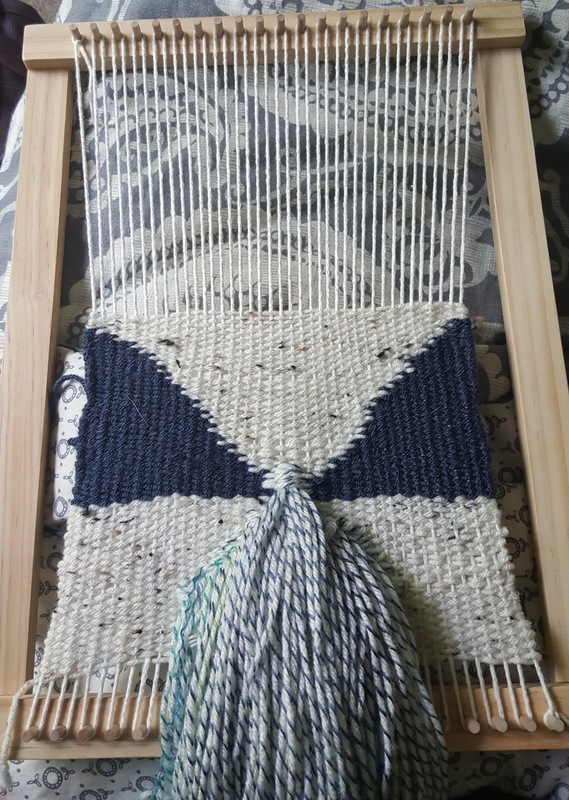 I found a smaller (8X10) loom at my craft store and while not the exact size I needed, it would be a lot easier to practice. I also bought a tapestry needle to make it easier. 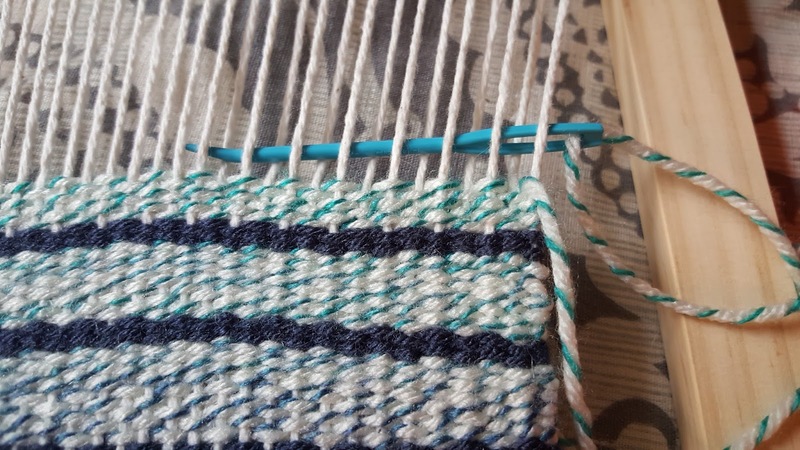 A tapestry needle has a bent end making it easier to weave though the warp with. I started again. This time keeping things nice and loose. 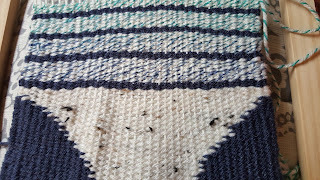 I was able to do several stitches including the basic stitch, the hem stitch, and rya knots. I completed this smaller tapestry over a few hours on the weekend. It still narrowed a bit but not at all like my first attempt. I also had some wool roving so I tried out weaving it in the design which creates the large fluffy bumps towards the top. I really like how it turned out and feel better about starting a larger project next time. I plan to have a video on Hobby + Hound that shows all the detailed steps coming soon. 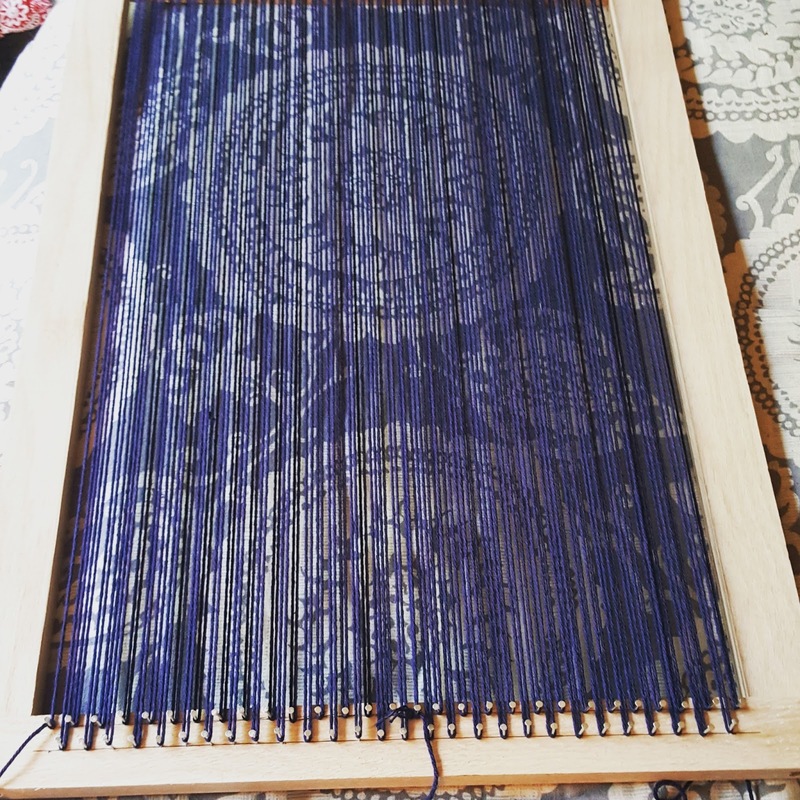 It will include starting the warp, beginning the loom, transitioning colors, different stitches, stitching designs together, and finishing off.